Orono, MN | Parade of Homes Remodelors Showcase 2009. Remodel Kitchen, Main Level, Owners, Suite, Whole House. Start with a 1960’s built home remodeled twice without consideration of design, green building principles or energy efficiency. The challenge was on TJB remodeling’s team to create a redesigned floor plan incorporating the principles of MN GreenStar’s building and certification program with the homeowner’s desire for a modern style with parallel lines, simplistic motifs and use of metal and wood in combination to create eyecatching focal points, such as the stainless steel railings, and two-story Living Room with vertical-paneled wall. 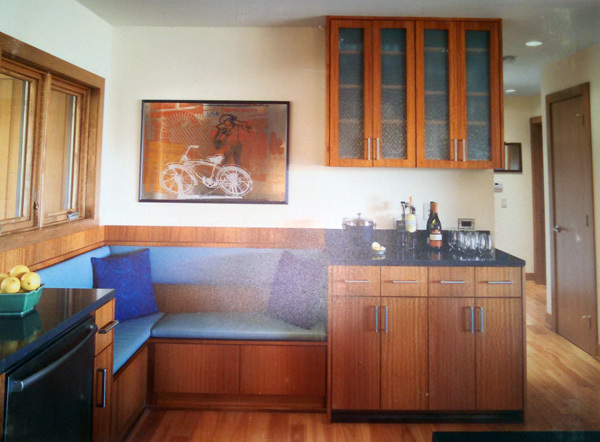 The kitchen cabinets are frameless African mahogany. Designed by www.nguyenarchitects.com. When Scott and Jen Hanson made the decision to renovate their 1960s Orono home, they knew right where to start. Scott’s good friend from high school, Tan H. Nguyen, AIA, of Nguyen Architects, Inc., shared the couple’s design and environmental sensibilities. And for a house that’s been twice renovated-most recently in the mid-1980s-with little regard for design considerations, the home was long overdue for a major overhaul. Since the Hansons want to start a family, they also wanted a truly fresh, clean slate for their home. The house on Lake Minnetonka, though roomy (4,600 square feet) and on a beautiful wooded lake view lot, had issues. The lake views had been sacrificed to a poor layout: The kitchen was a cave-like "cubbyhole," according to Jen, and upon removing the walls and ceilings, it ultimately revealed that mold, mice and bats had been making their homes there. 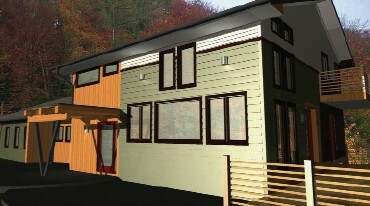 Nguyen’s design for the home kept the basic exterior shell/footprint intact, with its two-story main section and one-story bedroom wing, but the house was gutted to the studs and completely re-sided during the renovation. By incorporating several simple yet dramatically effective changes, Nguyen created a cohesive design that both embraces the wooded lake views and creates a better flow of living space. Removing the wall between the existing kitchen and family room afforded views of both the lake in back and the woods in front of the house. Now, the kitchen is a place for guests to gather-either around the island or lounging in the corner nook-and enjoy the view, while the cook benefits from their company and some much-needed elbowroom. Nguyen reversed the layout of the master suite, something Scott says they would have never thought of themselves. 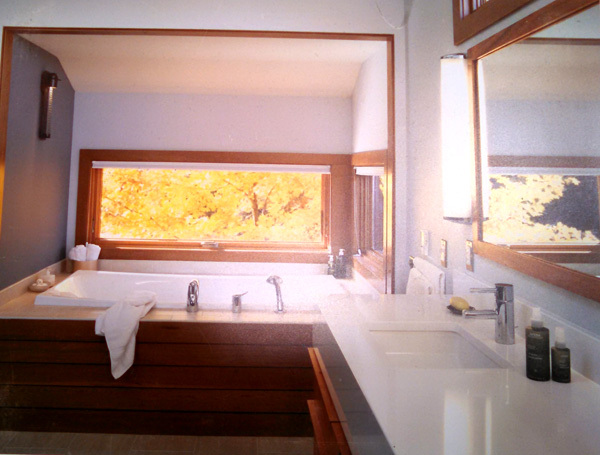 By flipping the existing closed-off bath with the bedroom, Nguyen was able to create a master retreat with floor-to-ceiling windows overlooking the backyard and bay (the couple can enjoy lake and wildlife views from the comfort of their own bed), a separate sitting area that also enjoys lake views, and a spacious bathroom with its own secluded wooded view. The natural setting reflects the Hansons’ philosophy-living "a healthy, environmentally friendly lifestyle," according to Jen - so the idea of incorporating these commitments within their home was paramount. The design plan and the aesthetic of the home both mirror its thoughtful approach to modern green living. Nguyen says, "The design is amazing. There is a very cohesive theme throughout the house - a modern look with a cozy feel." Jen agrees, declaring that the end result is "beyond our expectations; amazing." 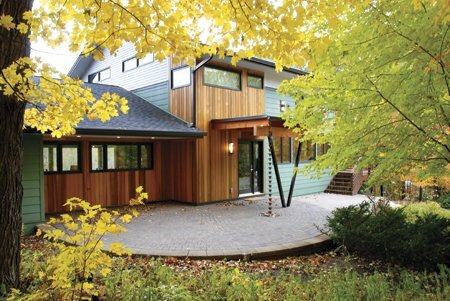 In fact, the home was recently named one of twelve 2010-2011 Home of the Month Selections, a collaboration between the American Institute of Architects Minnesota (AIA Minnesota) and the Star Tribune newspaper. 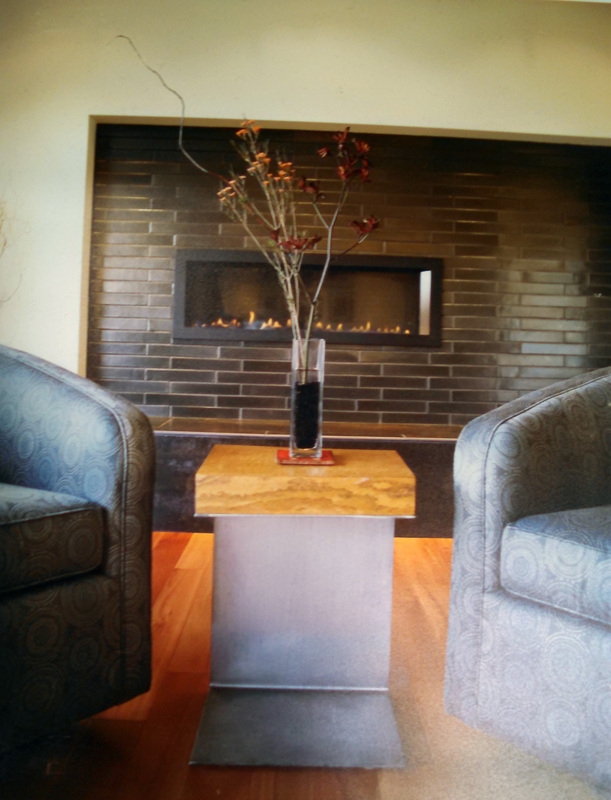 Nguyen and the Hansons worked closely together to address all design elements throughout the home. Jen and Nguyen made it a priority to keep the visual lines in the home clean, paying particular attention to the smallest details, like how surfaces and trims would start, end and flow together. The home is also well lit with natural light, "bringing the outdoors in," says Jen. The master bath design epitomizes that philosophy. 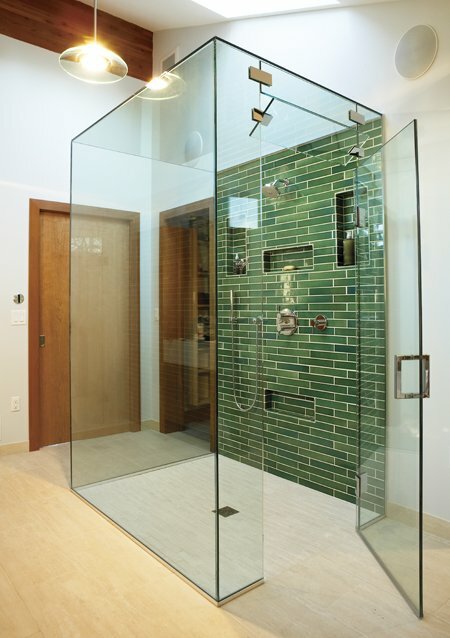 A glass enclosed shower (which conveniently traps the steam) even has a glass ceiling to regulate steam and to allow illumination from the skylight directly above it. A soaking tub is faced with mahogany planking and flanked by sleek horizontal windows at eye level for an intimate view of the woods. Since the team worked so closely together and was all involved in the design, says Jen, "the house feels like our home, not someone else’s." Another way the home is personalized? Scott, a master electrician, did all of the electrical work. Also a photographer and artist, the photos and paintings gracing the walls throughout the house are his. The Hansons know that those walls and windows are clean, well insulated and energy efficient - a comforting reassurance for the thoughtful couple. "Tan filtered what was most important to us," Scott says. Now in the process of becoming Minnesota Greenstar certified, the home’s renovation was required to adhere to stringent guidelines involving before and after aspects, such as: energy and resource efficiency (including durability), indoor environmental quality, water conservation and waste management, to name just a few. The intensive process involves strict attention to detail and documentation, spearheaded by Jason Budzynski of TJB Remodeling. 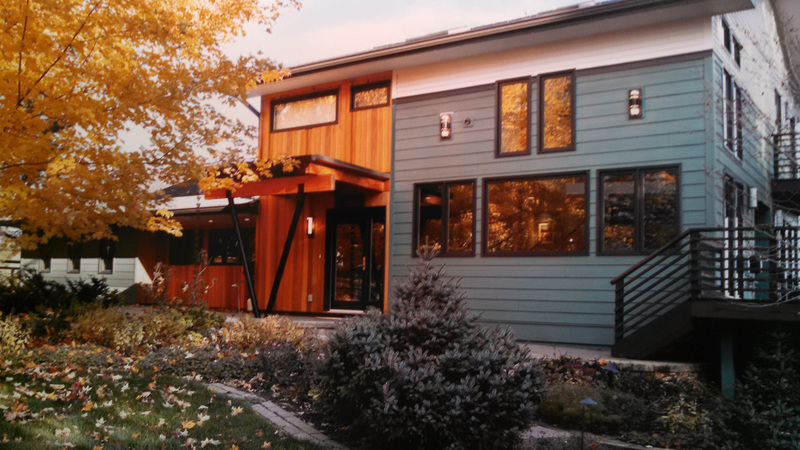 Though the Hansons’ home is the first Greenstar project the company has tackled, they have incorporated their own green standards ("Simply Green Built") into their new home and remodel projects. The Hanson project was also TJB Homes’ entry into the fall 2009 Parade of Homes Remodeler’s Showcase. Materials removed from the original building were recycled, "much like you would at home," says Nguyen. "Wood, metal and concrete are sorted in separate containers, then sorted further according to content and all product is re-used somewhere else." Since ’new green’ - new materials required to build green - has become readily available in recent years, obtaining those materials was not a challenge. Floors in the home are covered in Lyptus wood, a hybrid of two species of eucalyptus with a 15-year regeneration cycle (versus much longer cycles of other hardwoods). All cabinetry is constructed with formaldehyde-free glues, and all paints and finishes are low VOCs (volatile organic compounds) to improve air quality in the home. 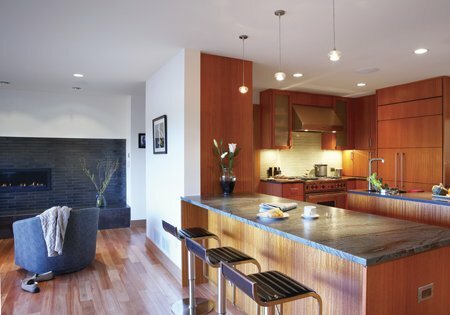 Kitchen countertops are soapstone (natural product not requiring finishing with toxic chemicals, as is required of granite) and Caesarstone (a synthetic, durable stone product). As with most design projects, Nguyen was faced with the challenge of design integrity versus cost of implementation. Never willing to sacrifice that integrity, he found some inventive ways to limit cost, and the homeowners expanded the scope of their vision for the home. Since the exterior needed to be completely replaced, Nguyen established a clean and modern aesthetic by changing the visual texture of the siding used and altering its application. He created a strong focal point of the entry for visual impact. Specific design features there include the accent created by the shift to vertical cedar siding, an entry canopy supported by two metal beams forming a "v" and an adjacent copper rain chain to divert rainwater to a small rock garden below. Such attention to detail appears consistently throughout the home. Inside, more effective design impact is created by focal points in the serene lofted two-story family room. The fireplace wall (also viewable from the kitchen) is faced with gunmetal iridescent handmade tile made by Heath Ceramics, a women-owned firm that specializes in mid-century modern glazes. 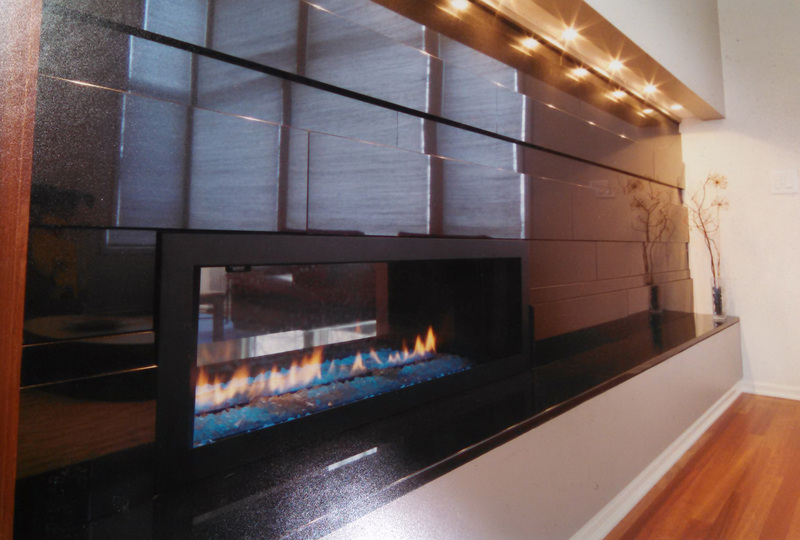 The gas fireplace itself is a focal point, a new design with a horizontal application, lit by imbedded LED lights that enhance the fire’s glow by illuminating crystals above the flame. The serenity continues to the two-story wood paneled wall (veneered with Makore, a West African wood) with lit niches, leading the eye to the adjacent lofted seating area. A stainless-steel-cabled railing provides maximum visibility and openness between the two living spaces. The team found clean-lined, modern furniture pieces at Room and Board, befitting the team’s vision for the home. In addition to their shared passion for design, owners and architect agree that their shared experience was a good one. Jen says, "It was great working with Tan. Working with an architect was a positive experience." When asked which is his favorite aspect of the house, Nguyen declares "the whole house, its influences, and that it is what the owners wished for - crisp, clean air captured in their new house." Custom handmade ceramic tile in master bath shower, kitchen backsplash and fireplace surround, Heath Ceramics; Sausalito, Calif.
What exactly is Minnesota Greenstar Certification? Minnesota GreenStar is a green building standard and green certification program for both existing and new homes that promotes healthy, durable, high performance homes. Our certification program embraces Minnesota’s climate extremes and natural resources and leverages its building codes and national leadership in such areas as clean water and combating climate change. Our green certification program takes a whole-systems approach applying the five key concepts of green building programs: energy efficiency, resource efficiency (including durability), indoor environmental quality, water conservation, and site and community. It also includes the eight components of the traditional building process: outdoor and site, building envelope and systems, mechanicals, electrical and lighting, plumbing systems and fixtures, finish materials and coatings, and waste management.